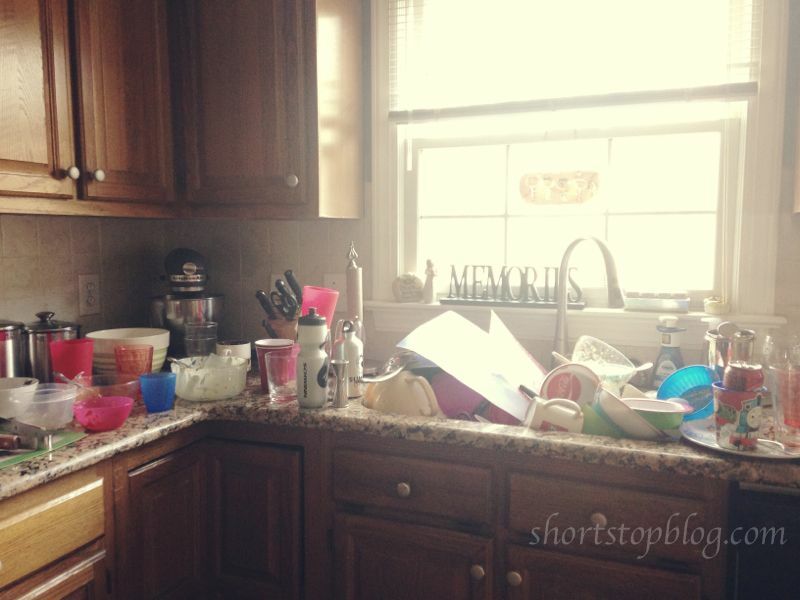 Will these dishes EVER be finished? Will I ever fit into those clothes, again? Will I ever really know if jeans should go over my baby-made, flesh-colored fanny pack or do I muffin-top it the rest of my life? Is there ever, like maybe, just once, a last load of laundry? Does jelly come out of silk throw pillows? Will I ever sleep, again? Ever? Do only mothers wonder everything and anything - all at once? You can have a clean sink, Sarah. Wouldn't you always, every minute, choose the latter? Of course. I would. They are my family. 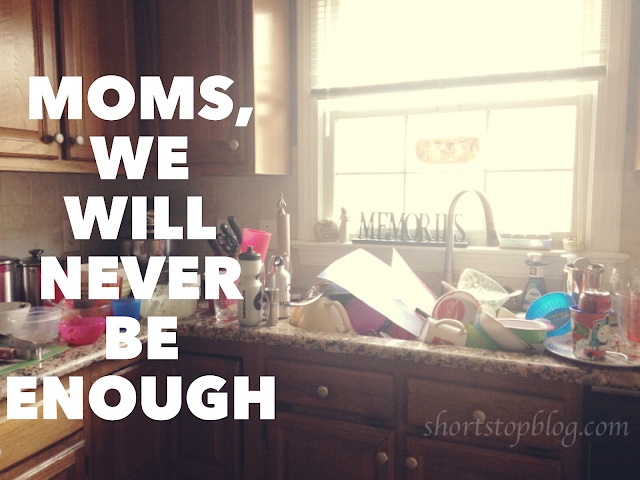 So, for the Moms with dirty sinks - who wonder if it will ever end. Who scrub three day-old "pasketti" sauce off of white porcelain plates. Who stand, achy feet and weary heart, over a sink full of yesterday and the day before and the day before that. You have a family. For the moms with laundry piles that aren't really piles because the gathering and sorting and lugging from this room and that means no piles, but instead life strewn memories dropped all over and everywhere of backyard football and front yard toddling into melting snow piles and peanut butter sandwich lunches and Oreo dunkfests. Who, arms heavy with memories, gently gather what is dirty so life can dirty it, again. You have a family. For the moms who wonder if a baby-made pouch of flesh-colored I carried you here should be stuffed beneath a too tight waistband or left to hang out above. Who wear birth scars and thigh dimples and yoga pants and Things Just Aren't Where They Used To Be. Who sweep their hands over the heads of the ones they once carried and feel those tiny hands wrapped around dimpled thighs and I love you, Mommy embraces. And, muffins and dimples could never carry more weight than this love. You have a family. For the moms who turn off the lights, well after midnight, when the work isn't finished, and walk upstairs with But, there is so much more to do. Who climb into bed, unshowered and unselfish, and climb out of bed, again, for one last peek and one last forehead kiss. Who know that unfinished is the theme of this season but who will fight tired so that sleepy-headed children know love. You have a family. For the moms who pack and unpack, sign and date and who marvel at stacks of papers wearing Froot Loop rainbows and backwards n's and new math and Great Job stickers and who wonder if there will, maybe one day, be a system that works that doesn't feel like imminent Death By Paper Drowning. Who throw away and save and throw away and save and can't quite keep it all straight. You have a family. For the moms who give. Every day. You have a family. For the moms with mismatched sock bags and dirty sinks. You have a family. For the moms who wonder - Am I enough? For the moms, in every season, in a thousand ways, who wonder if they are big fat failures - too fat, too tired, too much laundry, too many dishes, too little patience, too little Playdoh, too much coffee and chocolate, too many kids and just Not Enough Me To Do It All. God gave you your family. Knowing you are not enough. Knowing you can't do it all alone. So, He gave you Himself, Jesus - full of grace and mercy and power in every day, every moment, every failure. You have a family. And, you are not enough. Rest on this grace today, my friends. We never have to be enough. THANK YOU for this. Going through this especially in the last two weeks. I have four dudes also and am expecting...*maybe* a girl but if God is feeling extra humorous, it'll probably be another dude and I'll consider either starting a new monarchy or, a basketball team. God bless you! Thank you for this. I was just asking myself "am I enough for my children?" Before I read this. I feel so much better now. Thank you for sharing your heart and allowing God to share His heart through your words... such a blessing! wow, that is an awesome post. Thank you! There will be a day when your family is old enough, tall enough and skilled enough to help out with these things too. Something to look forward to. I had my kids start doing their own laundry at age 10. But Lorelei wanted to start at 8 because the new washing machine plays music when you turn ot on... As a previously single-for-a-time-mom I have two words for you now: paper plates. :) blessings to You for seeing past the piles! Wow...exactly how I feel and SO needed this reminder. Thank you. Love it! Being a mother is taxing and transforming. I wish I could have it all together for my kids, but I have a feeling that they learn more from a mother who is trying her best than they would from one who already knew it all. Thanks for the sweet encouragement today. Your blog is my go to for days like today. After time in the word in the morning to get me through to lunch, then a reminder of God's word and the reality that other momma's are doing the same as me today….this is much appreciated :) Because after God's word, prayer and the reminder of other momma's, we just wait for those Daddy's to come home. so glad a friend passed this on to me today - thank you for sharing this! Sarah, I love this post so much. A friend of mine on Facebook shared it with me because we are similar - very much so actually. I started writing in 2008 because, like you, I just wanted to write. It's been quite a journey but I'm passionate about "keeping it real" and pointing others to Jesus. You do this beautifully here. Keep going!! So I was reading this while my 7 year old son was looking over my shoulder. He says, "Wow, they have a nice kitchen." Beautiful! May I introduce you to my daughter DaLynn, also a blogger, whose birthday is the date you posted this - http://holysplendor.com/ Be strengthened today in Him!